Cloudbursts are intense rainstorms that drop enormous amounts of water over a short period of time. Climate change is expected to make cloudbursts occur more frequently. Cities around the world are looking for better ways to cope with weather phenomena like cloudbursts. 1) If the risk of damage is high, prevent the damage. 2) If prevention is impossible, minimize the damage. 3) Reduce the city’s vulnerability. Meanwhile, following Hurricane Sandy in 2012 – which flooded nearly 20% of New York City’s total land mass, officials in the Big Apple decided they too needed to do something. 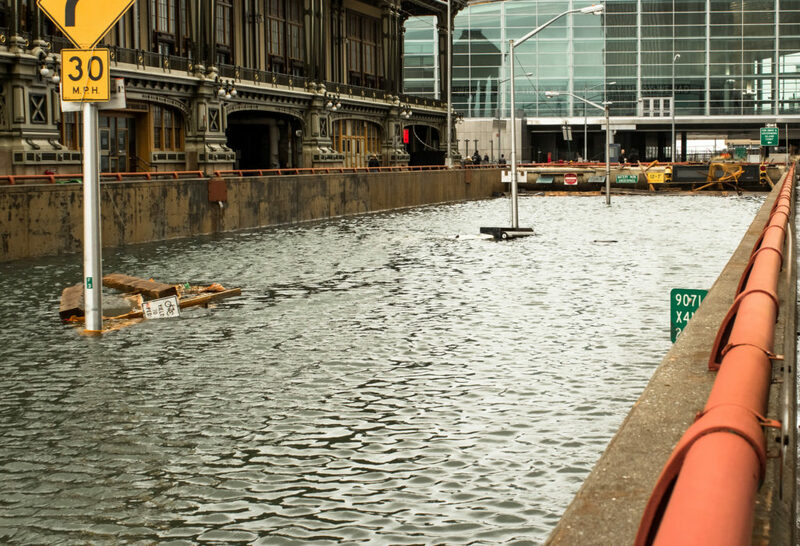 According to the New York Times, when New York City officials learned that Copenhagen had developed a master plan to deal with storms and runoff, the two cities formed a partnership. Officials from both cities decided they needed open spaces that can absorb water or at least slow water rushing through populated areas during and after storms. Officials say adding more green space or replacing asphalt with grass can increase the sponge-like properties of a neighborhood. “Flooding by design” – designing landscapes to hold water if it cannot be absorbed into the ground – was also found to be an important way to manage stormwater runoff or sewer overflows. An example of this would be a basketball court designed like an amphitheater. Maybe one day the Big Apple will be known as The Big Sponge. New York’s Next Nickname: The Big Sponge? Photo, posted October 30, 2012, courtesy of Patrick McFall via Flickr. ‘Cloudbursts and New York City’ from Earth Wise is a production of WAMC Northeast Public Radio.